PS. Sorry for my poor English. What does mean this "+!" next to the difficulty? Just a suggestion, Ginden has discovered a bug, which allows suicide bombers to run diagonally between pyramidz, brickz etc., and has exploited it in his level. 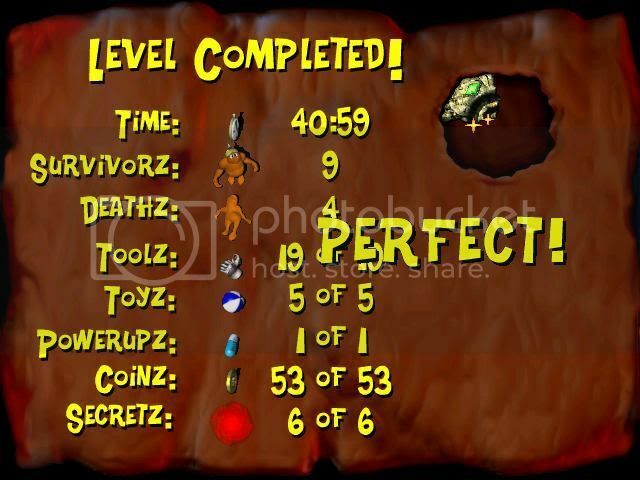 EDIT: I've just finished the level. I could send an imPERFECT score, if not the fact that PrintScreen doesn't work for some reason and I'm using version in foreign language. It meanz that (In My (Not So) Humble Opinion) the puzzle is 'Hard' ... even 'Very Hard' at timez, but not to the difficulty level of 'Frustrating'. That 'bug' has been known for some time, to the point that it is now "a feature". If you have a web host, and can store it there and provide me with a link in a Personal Message, I would very much appreciate it! You haven't achieved PERFECT because it's impossible, or 'cause you've missed something? In the second case, I might test it and try to get PERFECT result - it'd be a pleasure for me Of course if ginden is fine with it. Let me know in either case. It didn't even cross my mind to call this idea ( with BombGruntz running diagonally between piramidz etc. ) a "BUG". I was always considering it as a feature, the most obvious here. Because it's not mentioned anywhere and don't seem to be intended?... But anyway, interesting feature. You haven't achieved PERFECT because it's impossible, or 'cause you've missed something? Because I just wanted to pass the level, I'm not the type of hard secret-searcher. I believe that solverz will appreciate having a "View the map!" for this one! I am going to actually print it(!) to use in mapping out my approach to different mini-puzzlez. I had to go to bed and let my subconscious mind work on the very first mini-puzzle (twice!) in order to get to the first CheckPoint Switch! (Sometimez I get really bad about not "thinking outside the box" (tunnel vision) and miss something that should have been obvious from the beginning. Such as, I apply 'Water' thinking to 'Bad Water' ... which caused my first overnight delay. The second night was caused by my tendency to try the "brute force" approach, when simply taking a step back was the proper thing to do.) I have a newer version of the puzzle (that I have not downloaded) that may have some correctionz in it (other than the update to the "Author:" field) that I will use for today's testing. But, since I have not found any fatal flawz so far, I am tempted to distribute this one for everyone to try! It may even be worth a re-send, to get the input of more people on this CL. Let me know, people! How bad do you want to see this? Would you like to try it, even if it turned out to be impossible to achieve a "PERFECT!" score, and a re-send would be required? Zu's Statz Page image indicatez that finding Secretz is not required to get the Warpstone to the King ... only to achieve a PERFECT! score ... which is a "good thing" (meanz it may be played in 'Easy' mode). One true particular instance of bugz however would be the 'super springz', springz leaping 3 tiles regardless of what they are was certainly not an intended feature. What? You mean, three tilez instead of one? How it's possible? It's not (hopefully) impossible, I just haven't searched for secretz. In one particular case, a red warp is even right on the way that grunt must pass in order to complete the level, impossible to avoid. Uh, sorry, in this version is impossible to get "Perfect" score, because I forgotted about one rolling ball. GooRoo: can you upload new version to yours host? Tomalla: Can you send your opinion on GG2266700? Tomalla: mógłbyś mi napisać potem swoje uwagi na GG 2266700? This is something that I cannot understand, although I believe it has to do with Gruntz, possibly with this Custom Level. But since I cannot understand it, the ProBoards staff probably will object to it. Please modify your post, translated into English. It is something called "Terms Of Service", regulationz that specifically state that text must be in English ... or ProBoards could delete this Forum for violating the "English only" clause. Another Polish user speaking in Polish I don't get it. Why Poland?! About the CL, despite the fact I don't quite like this style of designing levelz ( Iron Blockz everywhere separating the already random puzzles, but don't worry - mine were just like these when I was a newbie ), the game have crashed twice for me so far, randomly I believe. After the crash I load the latest save slot and in the moment it happened before and should happen now as well - nothing occurs here. I don't know why is it happening though. the game have crashed twice for me so far, randomly I believe. After the crash I load the latest save slot and in the moment it happened before and should happen now as well - nothing occurs here. I don't know why is it happening though. It happens for me too, and after some searching, I've discovered that it happens when you quickly move camera while seeing the upper-left corner of this big lake above "Ginden" letterz. Which meanz it's pretty easy to do this if you're currently at the moment when you need shield grunt and straw grunt standing on the purple switchez after going trough arrowz. 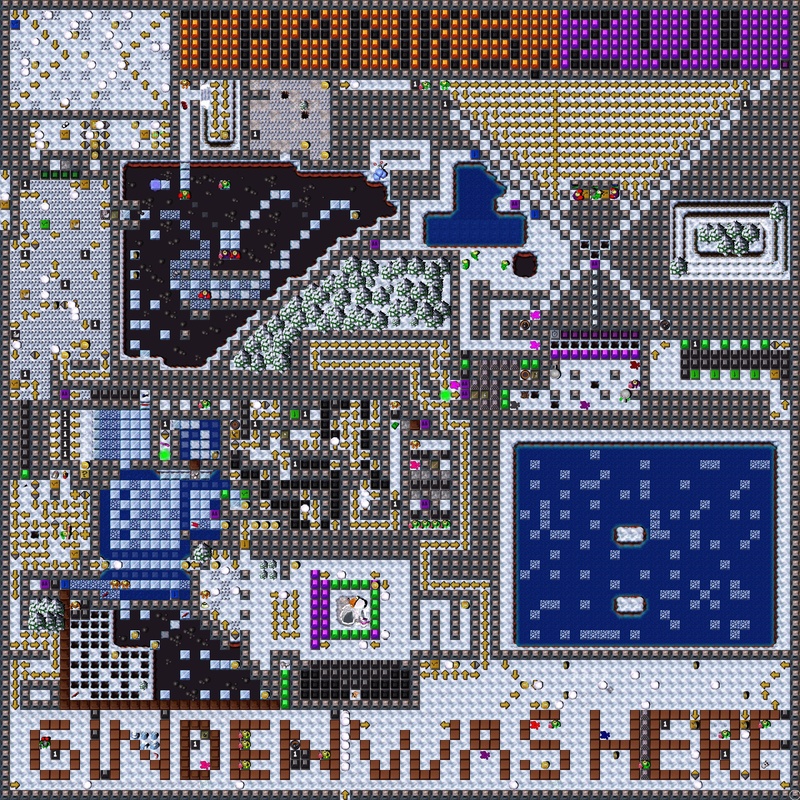 EDIT: Dang... not "Ginden", but "here". Nope. First time it happened while walking on the arrows with my GravityBootz Grunt far to the left part of a map, and the second time in the bottom-right corner of a map, a while after I picked up the Shield. Edit: Partially you're right. Everytime I'm sliding the screen upward, it always gets stuck in one particular place - then the game crashes. I wonder what it might be? Everytime I'm sliding the screen upward, it always gets stuck in one particular place - then the game crashes. It took me a while to figure out what the Scrolls were for; I had to restart the CL once. I have the Statz Page image SAVEd to my hard drive, and will upload it to the web site next. I will leave the rating as 'Hard+' ... I believe it! Can you write something more?